Melvyn Bragg and guests discuss the Nicene Creed which established the Divinity of Christ. "We believe in one God, the Father Almighty, Maker of heaven and earth, and of all things visible and invisible. And in one Lord Jesus Christ, the only-begotten Son of God, begotten of the Father before all worlds." Thus begins the Nicene Creed, a statement of essential faith spoken for over 1600 years in Christian Churches - Catholic, Orthodox and Protestant. But what has become a universal statement was written for a very particular purpose - to defeat a 4th century theological heresy called Arianism and to establish that Jesus Christ was, indeed, God. 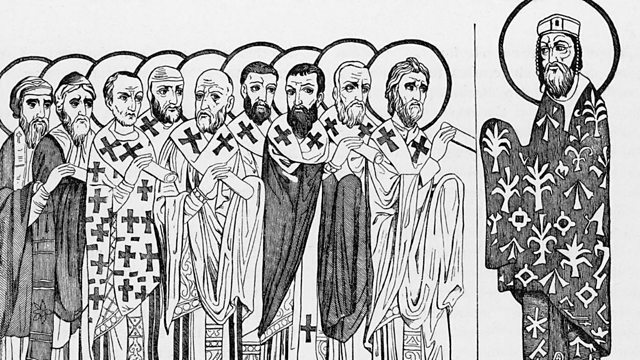 The story of the Creed is in many ways the story of early Christianity – of delicate theology and robust politics. It changed the Church and it changed the Roman Empire, but that it has lasted for nearly 2000 years would seem extraordinary to those who created it. With Martin Palmer, Director of the International Consultancy on Religion, Education and Culture; Caroline Humfress, Reader in History at Birkbeck College, University of London; Andrew Louth, Professor of Patristic and Byzantine Studies at the University of Durham.